Andrew’s Mom started the tradition of baking cookies for Andrew and his brother every Valentine’s Day for as long as he can remember, and last year Andrew decided to make this a tradition for our little family as well. 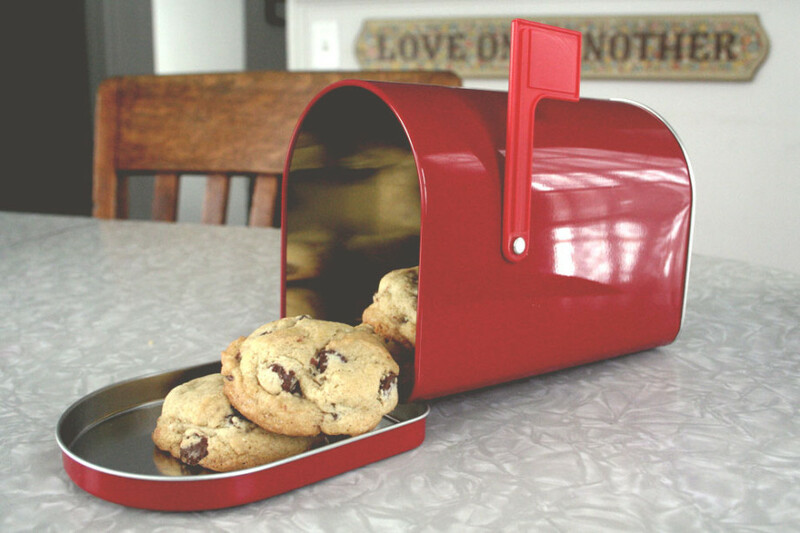 He found two little red metal mailboxes into which he puts the cookies for the kids to find on Valentine’s Day morning. He’s been tinkering with his cookie recipe for awhile now, but this year’s cookies were, really, really good. Maybe even his best yet. So I thought this would be a great post to kick off our new series called The Kitchen Tinkerer, but more about that later in the post. First, these cookies! These are basically all the same ingredient from the original recipe but he uses mostly organic ingredients, which for the most part don’t perform differently than their non-organic counterparts with the exception of a few. The key to this recipe is in these few ingredients: Salt, Sugar and Brown Sugar. If you’ve never made chocolate chip cookies with coarse salt, I highly recommend it. It’s the exact combination that makes chocolate covered pretzels so damn good. He usually lets his cookie dough sit in the fridge for a number of days before baking. It’s a rare occasion when he bakes cookies the same day he makes the dough. 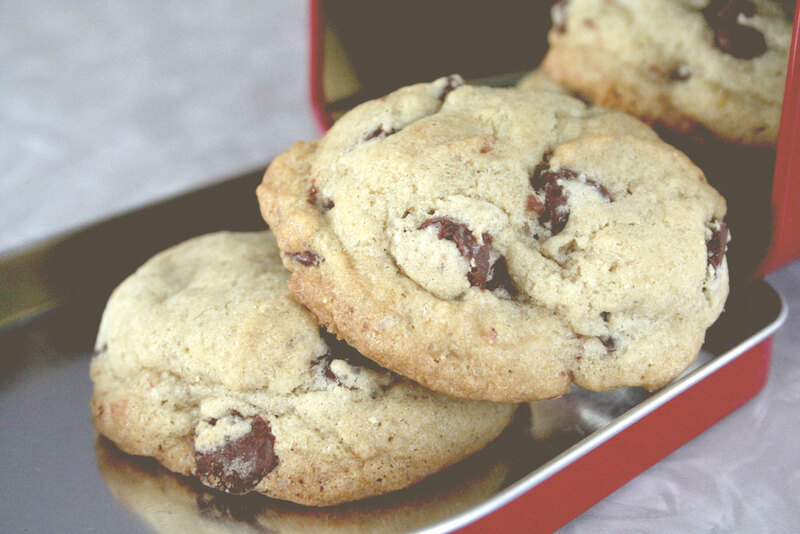 From his research and experience, letting your cookie dough rest helps brown the cookies more evenly and makes the cookies more crispy on the outside and chewy in the middle. It also helps the flavors integrate fully. However, for this version the dough rested for only about 10 hours. Maybe this was a factor, but I’m sure he will experiment again and let you know. The reason why Andrew is the most brilliant baker I know is because he is tireless in his experimenting. He gets intimate with the ratios and formulas that comprise basic recipes then, he tinkers. He is a master tinkerer. I don’t know anyone else who refines a process like he does. Despite the fact that almost everything he’s made is amazing, he would never say that he’s mastered anything in the kitchen because, in his mind there is always room for improvement. And yes, he follows recipes, BUT he knows when to break the rules and he knows how to adapt things because of the formulas and ratios he’s learned. One piece of wise advice he gave me after I burned a batch of granola was, “Never be a slave to a recipe.” and that pretty much sums him up. I’m always encouraging him to write about his experience in kitchen experimenting. Whenever he tells me his latest adventure, I’m fascinated! Maybe it’s because I’m not a baker. The mysteries he unravels are just that, mysteries to me. But I honestly think he has some serious knowledge to drop on novices and experienced bakers alike, despite his humble opinion of himself. Since he won’t take my advice and start his own thing, he’s agreed to make occasional appearances here where we’ll discuss his experiments, hence the The Kitchen Tinkerer series. Hope you enjoyed this installment! Crystal , these cookies look delicious. I’ve tasted Andrews pizza and I know he is a whiz in the kitchen and on the outdoor oven. Please protect my email . Thanks Linda! Glad you enjoyed it. Hoping to do a pizza post one of these days soon! P.S. Don’t worry, your email is safe with me ;) My site doesn’t post the email address of people who comment on my site, so no need to worry.